Victoria Falls in Zambia from an "Angel Flight" over the falls. 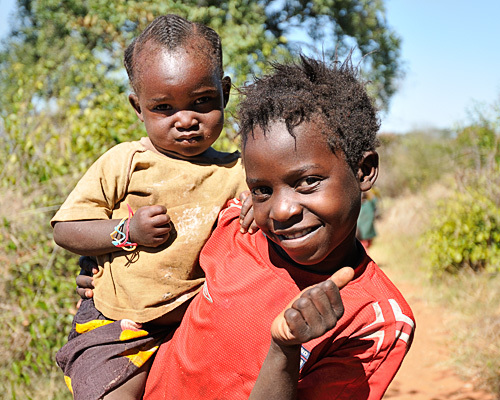 In 2010, after years of planning, our family embarked on a two week trip to Africa to visit Zambia and Botswana. This was the first time I ever started planning a trip and postponed it for a year because I felt I needed more time to plan and organize! It's easy to get overwhelmed...most North Americans think of going to "Africa" and forget it's huge continent, made up of many countries. Deciding which ones to visit and how is a job that I felt required a specialist. I started by reading the books about how to plan a safari. Our group was 7 family members and we wanted to go on safari privately, with just our group, so we ruled out a group trip offered by US based tour operators. We were traveling with people with health issues that prevented the less expensive mobile tenting options (and sleeping cots) and 3 teenagers whose safety was my top concern, which made me rule out a few countries that I might have visited as adults but did not feel comfortable taking my own and my sister's child! And of course, we had a tight budget! The itineraries I received from the major player in Africa Trip Planning included destinations I had specifically asked to rule out and I got discouraged. I went to Trip Advisor to ask questions of the Destination Experts there. 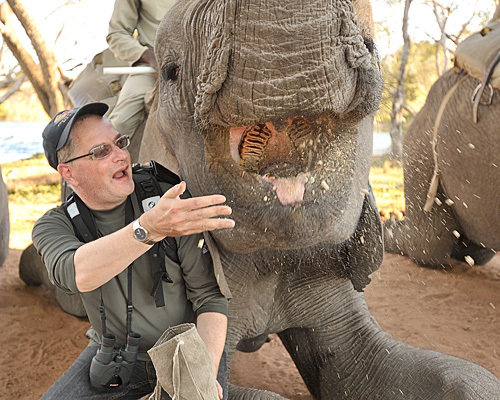 I was very lucky to find Craig Beal, of Travel Beyond who patiently answered my questions. After being impressed by his online advice, I made a couple of phone calls and found that the itineraries he planned for us met all our needs. He suggested we could stay in top Wilderness Safari camps in the countries we preferred by travelling at the very end of the shoulder season, and taking advantage of special extra free night offers being offered during the challenging economy of 2008/9. It was still a high budget trip ( $1000 per day per person is not an unreasonable amount to budget for each day at a full service safari camp) but Craig and VP of Travel Beyond, Jenny Mikkleson, put together a trip that not only fit our budget but included all our dream activities and went seamlessly! 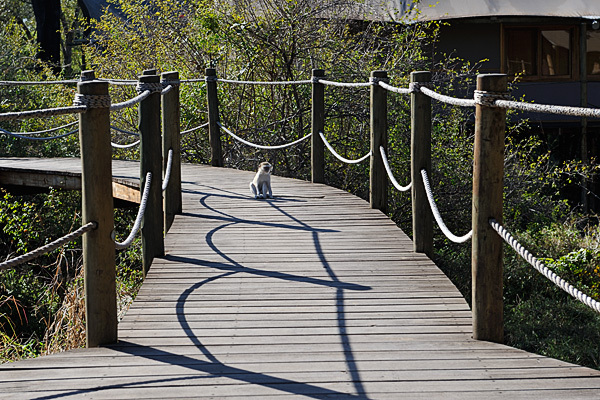 Our trip started at the Wilderness Safari's Toka Leya Camp in Zambia. 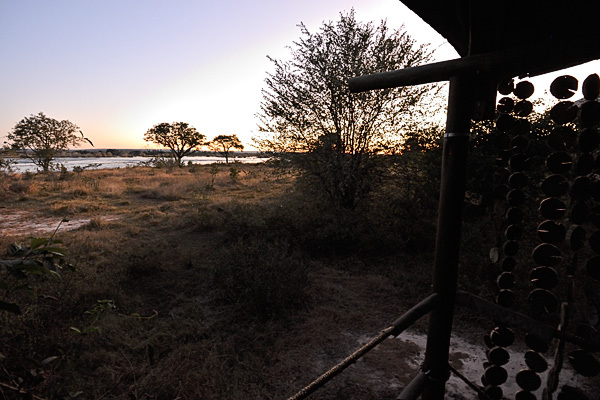 Toka Leya is on the Zambezi River, adjacent to the Mosi oa Tunya National Park and town of Livingstone, as well as Victoria Falls. It's location was a good place to start our safari, and although the camp was quiet and felt remote at the edge of the national park. it was close to many activities our family wanted to experience before taking a deeper dive into the very remote camps of Botswana. 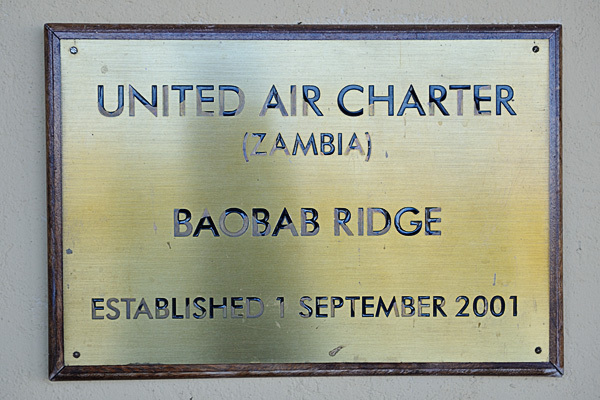 In addition to taking a game drive in the National Park, we were able to take an elephant back safari, take a boat safari along the Zambezi, visit a village that the Wilderness Foundation supports, and tour Victoria Falls as well as take a "angels flight" helicopter trip over the falls. One of the highlights of our stay at Toka Leya was when the rare rhino wandered near the walk ways of our camp and the camp manager called us away from breakfast to watch these magnificent endangered animals graze near our tents! 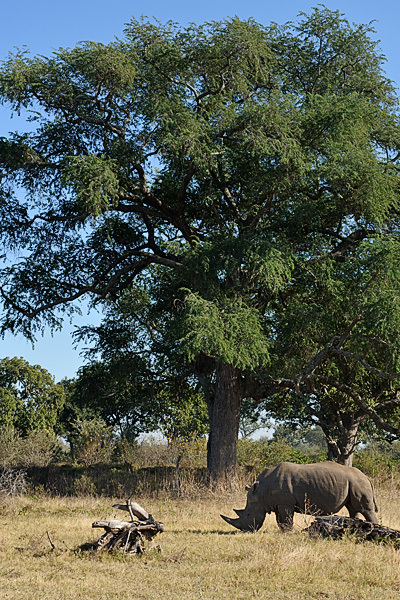 One of the 'Big Five" our best chance to see rhino was in Zambia, and we were fortunate, they came to see US near our camp! 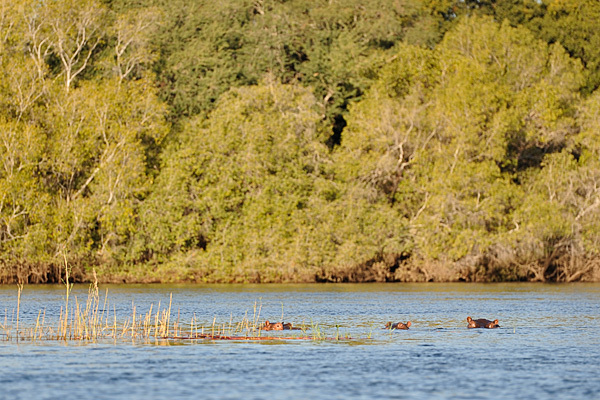 There are a few different ways to experience the Zambezi. You can get out on a large tourist boat; imagine dozens of people on a large boat with music and food and drink, where the wildlife viewing seems like just part of the attraction. Or you can arrange to take a small boat tour, with professional guides, who can nudge into small coves to find huge crocodiles and get close to elephants browsing on the shore. Another option is to take an overnight cruise along the Zambezi, allowing for several days to soak up the atmosphere long after the noisy day tours have docked for the night. You could also find a professionally guided canoe trip. Gliding along in a small group, under your own steam (with a good guide who can recognize how to avoid territorial hippos) would be an amazing way to experience the Zambezi river. Toka Leya offered a small boat sunset tour of the Zambezi River from the camp. A big old bull came to the shore as we motored by in the boat. 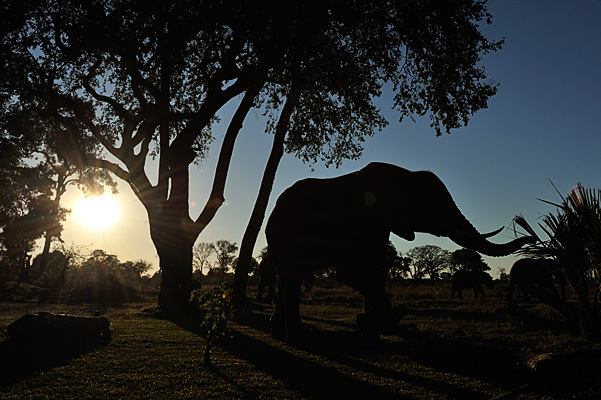 Later, when we landed on shore during a beautiful sunset sun downer (snacks and drinks set out to enjoy the sunset) a whole herd of elephants attracted by the snacks set out, started heading toward the tables and chairs Toka Leya Staff had set up. Our guides quickly ushered us safely back to the boats and we watched from the water as the elephants used their trunks to carefully eat all the snacks meant for us without knocking over a table or breaking a dish!! There is also more than one way to see the Victoria Falls. You can go to the Victoria Falls National Park and hike or drive around to all the various sites. You can also rent rain gear and walk alongside the falls and feel both the spray and the power of the falls so loud you can scarcely hear each other exclaiming about them! Another way is to take a helicopter tour over the falls, known as a "flight of angels", these concessions are run by private concerns and it's best to work with a good travel agent who knows the area to ensure you get a safe operator. Another option, that is limited by the time of the year is to go for a swim in the Devil's Pool above the falls. This is not something I would ever try or even recommend, after seeing the pictures of people lolling withing inches of the edge of one of the world's largest water falls!! 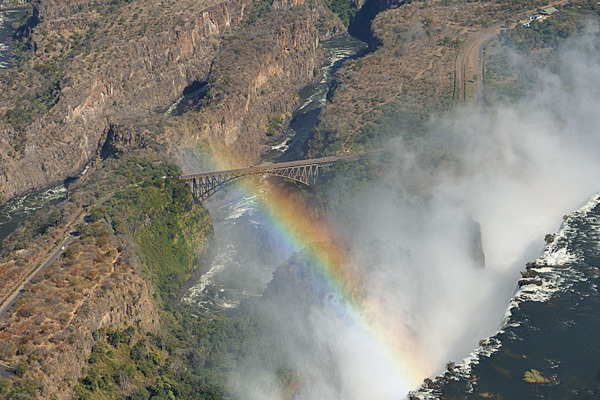 The Victoria Falls from helicoptor, known as "smoke that thunders" or Mosi oa Tunya, water vapor rises from the cataracts and the sun creates rainbows. Click on any photo below to expand. We had the opportunity to experience the bush on the back of an elephant. These rescue elephants are much loved and well treated, each with it's own caretaker. Getting the opportunity to travel through the national park, silently. Despite what your mother says about sounding like a herd of elephants; elephants are extremely quiet when moving through the bush. High upon the back of an elephant, we were able to see the bush from a prospective you can't get from a Range Rover, and because the other game in the National Park expect to see elephants, they are easier to approach as a large group on elephants than in Rovers or on foot! After loading 2 people on each elephant, we headed out into the National Park. We encountered wildlife including warthog, giraffe, antelope, and wild elephants which did a bluff charge of our group and led to lots of drama as the domestic elephants gracefully turned and ran from the wild elephant! The herd that is used for safari are mainly rescue elephants found in captivity elsewhere that can't be returned to the wild because they are too habituated to humans. We were told these elephants are allowed to roam in the national park and they return to the handlers and the barn because this is what they are used to. Occasionally one of the elephants comes back expecting a calf from a wild bull elephant! When they go out on safari, all of the elephants go including the ones too young to carry people. These juvenile and baby elephants follow their mothers and aunts and frolic and tussle just like human children, and mothers call to and cuff the young ones when they need some redirection! One of the most enjoyable parts of our elephant safari was being "part of the herd" and watching the dynamics of their family! Notice the little baby elephant "photobombing" our picture on elephant back along the Zambezi river! After we returned to the barn, we were able to give the elephants a little "treat" and take photos of these beautiful animals! The Wilderness Wildlife Trust is a non profit associated with Wilderness Safaris, and they do many projects, including community empowerment. 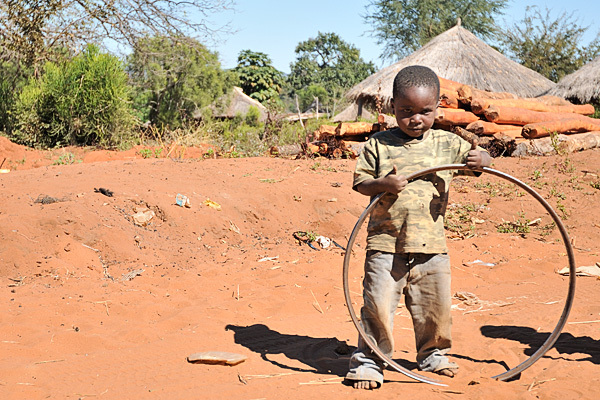 We were fortunate to tour one of the villages the Wilderness Wildlife Trust works with and meet some local people and see the work they have done there. It's also where we had one of our most amazing "small world" experiences! As we arrived at the village, the local shopkeeper was assigned to be our guide in the village. On our way out to the village we noticed a sprawling used clothing market, with donated clothing laid on the ground for purchase in Livingstone. When we met our guide, we noticed immediately that he was wearing a tee shirt from the hometown of most of our group! We recognized the town's youth soccer logo and one of the local businesses that sponsors the teams! 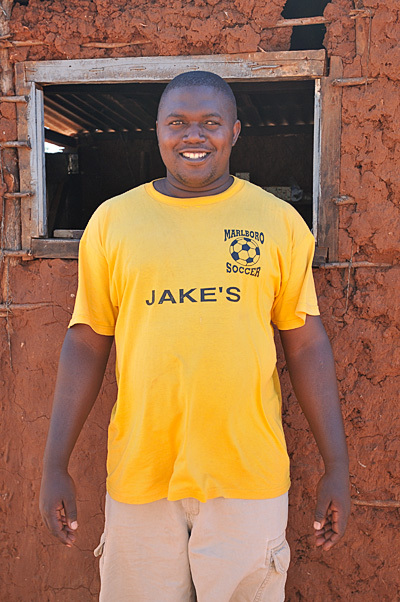 It seemed incredible to us to travel halfway around the world and find that one of the tees' donated in our hometown was being worn by a local resident! Imagine our surprise, when our tour guide was wearing a tee shirt from the youth soccer program in our hometown back in the United States! Junior stands in front of his store. We arrived close to lunchtime, so all the children were on lunch break, and were happy to guide us around their community. Our daughter happened upon the local children's choir rehearsing for an upcoming visit by the local Bishop, when she explained that she was a singer in her own church choir, the director invited her to join them to sing! We received a warm welcome from the children. One of the most interesting things about seeing game in the wild instead of at the zoo, is how so many different animals travel together for the benefit of both animals. 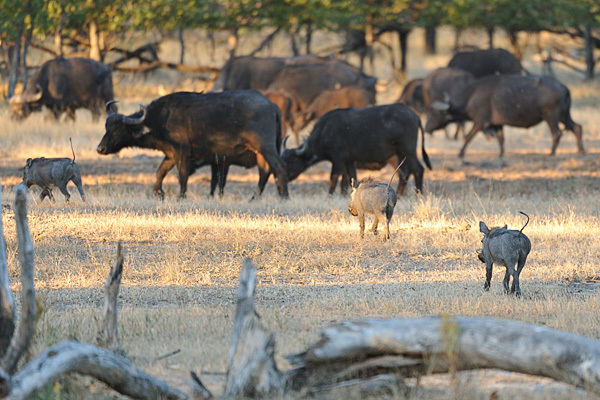 For instance, in the photo below, warthogs often travel with a herd of buffalo for protection from predators, or as we saw at another camp, many animals stick close to giraffes because of their ability to spot predators at long distances! Our experience in Africa was that predators have their work cut out for them, as all the prey work cooperatively to avoid them! In one camp, as a leopard was stocking antelope, all of the birds in the area were sounding the alarm, tipping off the herd (and our guide!) of a predator in their midst! Our visit to Livingstone Zambia was short, just 3 nights at Toka Leya Camp, but we were able to experience the world famous Victoria Falls by land and by air, visit a local village, and experience the National Park for game spotting by boat, on elephant back and by Range Rover. We also enjoyed the entertainment at the camp itself, where after dark, the riverside campfire ring became a place for dancing and singing! Botswana Trip Report Under Construction!